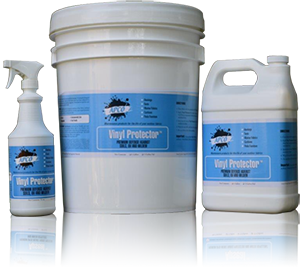 Professional grade and environmentally friendly, concentrated vinyl cleaner. Designed to remove a broad range of soil from all vinyl fabrics. 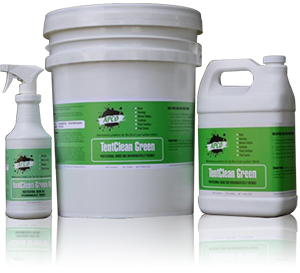 Applications: TentClean Green may be used on all vinyl surfaces. Can be used for general maintenance and heavily soiled conditions. Coverage: Depending on the degree and type of soiling, method of application, concentration and environmental conditions, you may expect to clean approximately 600 square feet per gallon. Important: For many (but not all) vinyl fabrics, we suggest the cleaning be followed up with an application of APCO Vinyl Protector to further enhance the appearance and help shield from environmental exposure, reduce soiling and inhibit mildew growth. Effective for the removal of most soil and improved removal of “chalking” due to plasticizer migration. Applications: VinylClean Plus may be safely used on virtually any vinyl surface. Strong enough to remove stains, yet safe to use on a frequent maintenance schedule. Designed to restore and maintain vitality to vinyl fabrics. Formulated to repel dirt, inhibit stains, and improve visual appearance. Coverage: Depending on the method of application and environmental conditions, you may expect approximately 600 square feet per gallon of surface protection. * Vinyl fabrics that have a clear topcoat may not require an application of protector.